Seagreens® Ascophyllum grows wild among the remote islands where we harvest in relatively shallow water down to about 5 meters. Seagreens® Pelvetia grows on the inter-tidal rocks. It is called Channel wrack because it holds the water in tiny tubes during the ebb tide. Seagreens® Fucus grows in shallow water along the surface, its length containing numerous ‘bubbles’ which keep it afloat. 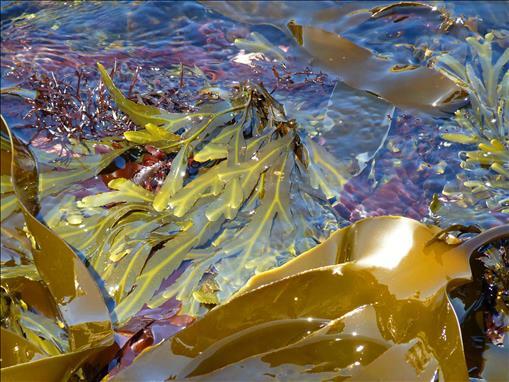 Wild harvested seaweed needs no soil, fresh water, or fertilisers. It feeds on the primordial nutrient soup which is the ocean. 40% of the land surface of the earth is in agricultural use, already beyond its nutritional capacity. Yet the world's oceans are 7 times this size. 40% of the total species at our Icelandic production, surveyed and approved by the Icelandic government, is available for sustainable harvesting. Yet we currently trim only 10% of this total biomass, in any case allowing each plant to regenerate before harvesting again. This small portion of the (sustainable) potential annual harvest is typical in Norway, Scotland, and Ireland, where our production consortium is also active. Over more than 20 years we have developed our methods, technologies and procedures to produce Seagreens' unique quality for human nutrition. Seagreens began in Norway, then we brought our know-how to develop human food seaweed in Scotland through Hebridean Seagreens, a joint venture with the Hebridean Seaweed Company Ltd - with which we are no longer associated. Today we are active elsewhere in Scotland, Ireland, Iceland and Norway, our Production Partnerships developing a responsible and sustainable new industry in the British Isles and the Nordic region with worldwide markets. For 20 years we have been selecting wild seaweeds, then researching, and over the past 10 years we have acquired a unique resource of comparative data, across each productioon batch, across species, both for the good stuff (nutrients) and the bad stuff (contaminants). We use this data to monitor and continually improve our harvesting and production - going right back in the process to raw material selection. It gives us the edge we have in terms of our ingredient quality - which is why companies like Pukka, Viridian, Waitrose and many others for whom quality is paramount, use Seagreens® ingredients. To maintain consistency we cut specific lengths of fresh living seaweed from monitored new growth at the right age and time, ensuring sustainable regeneration. Each batch is extensively analysed at independent UKAS accredited laboratories. Only consistently good results produce the Seagreens® you ultimately consume, either in our own products, or the products of our manufacturing and retail customers. This obsessive pursuit of quality is what makes Seagreens® outstanding even after 20 years! For a brief introduction to our production quality, please click here.